You know you're in a bad place when you feel like reading Dostoyevsky .. as a way of commiserating with someone who can relate. He was screwed over pretty badly. Critics claim it was these experiences that enabled him to write with such penetrating insight. "The writer's own troubled life enabled him to portray with deep sympathy characters who are emotionally and spiritually downtrodden, and who epitomize the traditional Christian conflict between body and spirit. Dostoyevsky sought to plumb the depths of the psyche, in order to reveal the full range of the human experience, from the basest desires to the most elevated spiritual yearnings. Above all, he illustrated the universal human struggle to understand both God and self. Dostoyevsky was, as Katherine Mansfield wrote, a man who loved, in spite of everything, adored life, even while he knew the dank, dark places." "Who loved in spite of..." That's not easy to do. 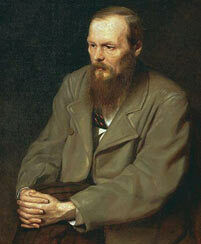 Even those who don't like Dostoevsky concede ungrudingly he is "a titan of world literature." Einstein said, "Dostoevsky gives me more than any scientist." Freud called it, "The most magnificent novel ever written." Continue reading Commiserating with Dostoyevsky (Brothers Karamazov).